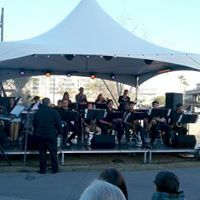 On Saturday February 24th, the Young Sounds of Arizona ensembles performed at the Scottsdale Canal Convergence Festival. The event was a celebration of music, art and dance all in a space that included public art installations. The invitation to perform came from Kevin Von Brubaker who lives in the Coronado neighborhood in downtown Phoenix that surrounds the AFM Local 586 Union Hall and often hears the Young Sounds ensembles practicing. He works for Scottsdale Arts and thought Young Sounds would be a great fit for the event, turns out he was right! Three of the Young Sounds ensembles performed over an hour and a half and festival go-ers were quite impressed, many of them stopping to ask Young Sounds staff about the groups or to buy CD’s. Director Andrew Gross and guest artist Kevin Tangney were quite pleased with the performances as well. Director Gross runs the 7 O’clock Big Band and the Combo Band and Tangney was assisting that day with the 5 O’clock Band and helps Assistant Director Doug Robinson with the 5 O’clock Band. It was wonderful to see the community enjoying the music, some even getting out of their seats to dance. Young Sounds followed up that concert with two days of performances at the Phoenix Art Museum’s Free Family Day on March 10th and 11th. This was a return performance for Young Sounds, as the outreach manager at Phoenix Art Museum was quite impressed with the ensembles last season and invited Director Gross to bring his students once again. As a community partner for this event, Young Sounds was offered 3 times slots to perform each day. The day’s event included dance performances and art making projects for children, in addition to free museum entrance both days. Attendees were enthralled with all of the performances and the students played with enthusiasm and energy, even garnering an invitation to perform at a wedding! Next up for Young Sounds is the April 9th concert at the Kerr Cultural Center with alto saxophonist David Glasser. Glasser is a veteran of the Clark Terry Quartet, the Count Bassie Orchestra (under the direction of Frank Foster), Illinois Jacquet, Barry Harris and Dizzy Gilespie. He will perform alongside our students at this special performance on April 9th.